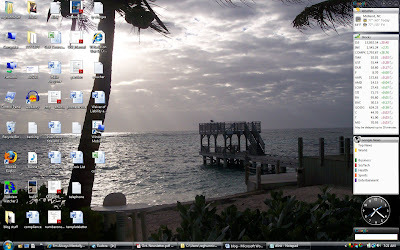 I was tagged by Kuckie to show my desktop. It is the same desktop I have had for several years. My sister Judy took this picture one February morning in St Croix, on the south shore. I just love the way she captured the light and the silhouette of the coconut tree. There is no doubt St Croix is my favorite place to be. Now I have friends there and I miss them too along with the island. My desktop is a daily reminder of my last and next visit to the island. I’m going to ask Jay Gray to reveal his desktop. He doesn’t need instructions. Yes!!! STX rocks! We have the best island in the universe!! But all our chickens override the polital BS. We got the coolest chickens in the universe, too! I like to put reminders of good times and happy stuff on my desktop too. Takes the drudgery out of having to stare at that computer all day.